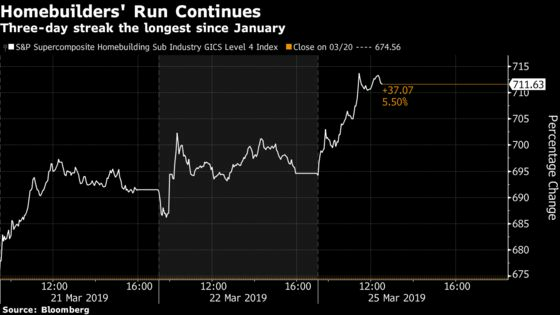 (Bloomberg) -- Homebuilders extended a three-day rally Monday, sending the S&P Supercomposite Hombuilding Index up as much as 5.8 percent during the advance -- the most in three days since late January. The rally means the group is on course to close at the highest last Sept. 21. All 15 stocks in the index are gaining in the wake of last week’s dovish Fed meeting. KB Home, set to report earnings post-market Tuesday, leads with a 5.5 percent gain. Susquehanna analyst Jack Micenko expects higher-than expected home orders to contribute to a positive performance, which could result in sales pace declines of only two percent versus the consensus estimated seven percent. Along with KB Home, top gainers include Installed Building Products Inc. and TopBuild Corp.